The Oregon Coast Bike Route is a premier cycling tour from Washington to California, along Oregon’s magnificent Pacific coastline. This book will expertly guide bicyclists along the 383 mile route, showing them what to expect with 360 photographs, numerous maps, and written descriptions, along with necessary reference material. Written by a veteran cyclist who has lived on the central Oregon Coast for more than 20 years, this guidebook will show the way for those wishing to ride the legend. This is the weird, wacky, and wonderful guide to cycling the entire Oregon Coast, as wild and wandering as the author himself – a must for all OCBR touring cyclists! Washington to California: Here are the Secrets! NOTE FOR DIRECT RESELLERS: For any business or library wishing to offer Oregon Coast Bike Route to patrons, this is accomplished through a distribution method that enables qualified resellers and libraries to order books at wholesale prices. Upon application, eligibility will be confirmed within 24-48 hours after creating a reseller account. Volume book order discounts depend upon the business type (Libraries, 20% / Retail, 35% / Distribution, 45%). Click HERE to initiate this DIRECT RESELLER process. 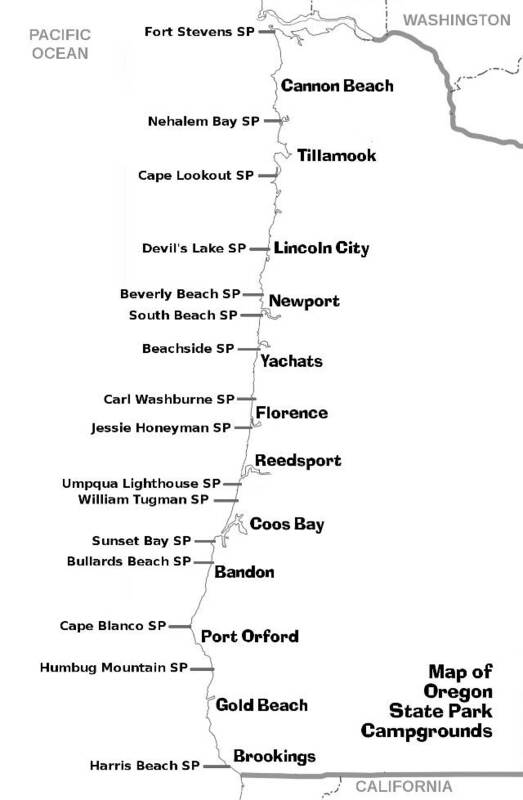 There are 16 Oregon State Park campgrounds along the 383 mile OCBR cycling route, with hot showers that make the challenges of the day melt away each evening! Triker Steve is as weird as the state in which he lives. Over 20 years of being on the Oregon Coast have altered his perception of life. Salt air has slowly corroded the synapses of his brain, thus he rides a tricycle instead of a bicycle. The patch hinders depth perception, and the missing tooth allows bad breath to escape, but it keeps the dinosaurs at bay. His books are ghost written ‘cuz he wasn’t never schooled. Known locally as the trike hobo, his source of income is the gold bullion only he knows how to find, because his books are too bizarre to sell. He rides a Catrike 700 speed trike when it’s not raining. Acquire this OCBR route guide at Amazon by clicking HERE. Word has been floating around for a while in the cycling community that a new route guidebook for the Oregon Coast Bike Route was needed. So, having lived here for more than two decades, I had the audacity to imagine that my puny brain might be able to create something that would amuse the pedal pushing masses, thus, I wrote the new guide. This is my final book, so I decided to get a little wild, break some rules, and conjure up what made me laugh – after all, if ya’ don’t have fun on a project, it will show in the product! This book is just flat bizarre on many levels, and not at all what cyclists would imagine, at least if compared to traditional cycling guides. If you want a typical cycling guide, keep looking – this is not what you seek! It has been rated PG for language by the Association of Recumbent Gear Heads (ARGH), so it will in all likelihood offend a few of my readers who have come to expect the most honorable and conservative straight and narrow path from my head. Oh well, such is life, but since this is the last book of all time from Trike Hobo, let it be fun, and just a wee bit weird, just like the weird state of Oregonia where I live! It has 360 photographs of the 383 mile cycling route. It has all the little known secrets between Washington and California. It has ghost stories. It has town histories. It has stuff about the dinosaurs. It tells about the pirates and gold bullion. It has details on where to turn. It lists bike shops. It has charts that detail stuff like Steep Hilly Intense Terrain. And it has some of the regional Oregonia flavor of dirty old cyclists who have been on the road for too damn long – the ones who may be in need of a shower. Anyway, enough of this idle mental rambling, as I type here all by myself at my little upstairs keyboard, a torture device attached to a screen that is turning my eyeballs to blurred jelly. My plans, from here on out, are to live life in the real world, not this virtual land of letters, so the 700 will be seeing more of my bum very soon (at least on sunny days, ‘cuz it’s a raining here now). So if ya’ want to get your own copy of this off-the-wall book, which has been priced at an inconceivable $15.00, so no complaining – click HERE to get it right now from Amazon. Oh, by the way, it’s only available in paperback form because it’s something all OCBR riders will definitely want to have in their panniers (it might add a few ounces to your rolling weight, but the ghost stories make for spooky reading in your tent at night). Boo! Click the book to get it!